The Alphabakes blogging challenge, organized by Caroline of Caroline Makes and Ros of The More Than Occasional Baker, who is this month’s host, is a favourite of mine. I have long cherished a weakness for recipe collections presented along alphabetical lines. My very first cookbook, I recall, was a compilation of children’s recipes, put together by Gold Medal Flour, that was organized from A to Z. The concept delighted me then; it still delights me now. And with such a bounty of culinary resources on the grocers’ shelves, the challenge of finding a recipe that starts with a certain letter or prominently features an ingredient starting with that letter, is not particularly onerous. Personally, I think that trying to decide on just one recipe is the hardest part. Last month, for example, the letter was O. I made oat biscotti, but plenty of other ingredients beginning with O were also clamoring for the spotlight, such as olives, oregano, oranges, and orecchiette. (Somehow all of these ingredients seem to point to Italy, and yet I used oats, a distinctly northern crop, to make my biscotti. In retrospect, this seems quite paradoxical.) And if you expand into recipe titles and foreign dishes, the scope becomes truly vast. Except when it comes to the letter X. Drawing the letter X in December was a fortuitous happening, as it allowed for the use of “Xmas” in the recipe title—provided, of course, that this term is included in your vocabulary. It has no part in mine. Aside from the deeper issues involved, it also happens to be the most unsightly word I’ve ever come across. I had no intention of featuring it in the name of my recipe. Besides, I wanted to know: are there dishes that truly do begin with X? Yes, there are, as some sleuthing on the Internet proved. I found myself confronted with the choice of several recipes from far-flung locations such as Portugal and India, most of them unpronounceable and all of them interesting. I eventually decided on the one that I could pronounce: Xavier soup. It is a dish traditionally served on the feast day of St. Francis Xavier, which takes place earlier in the Advent season, on December 3rd. This was enough of a connection to the Christmas season to please me, and I greatly enjoyed making the recipe. 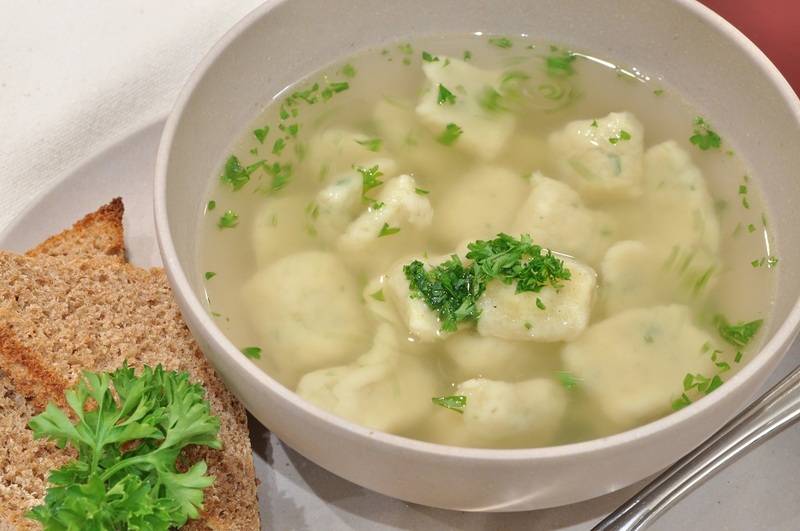 It is a simple dish of parmesan-and-parsley dumplings floating in a clear broth, warming and hearty enough for a main dish, yet still light and elegant. I especially liked the grassy note from the parsley. Parsley is so often relegated to mere plate decoration that I had almost forgotten that it had a flavour. I suspect that it will probably always be served at my house on December 3rd from now on. And for future reference, another stumper, Z, is one of the few letters that has yet to be drawn for the Alphabakes challenge. So it’s bound to come up within the next few months. 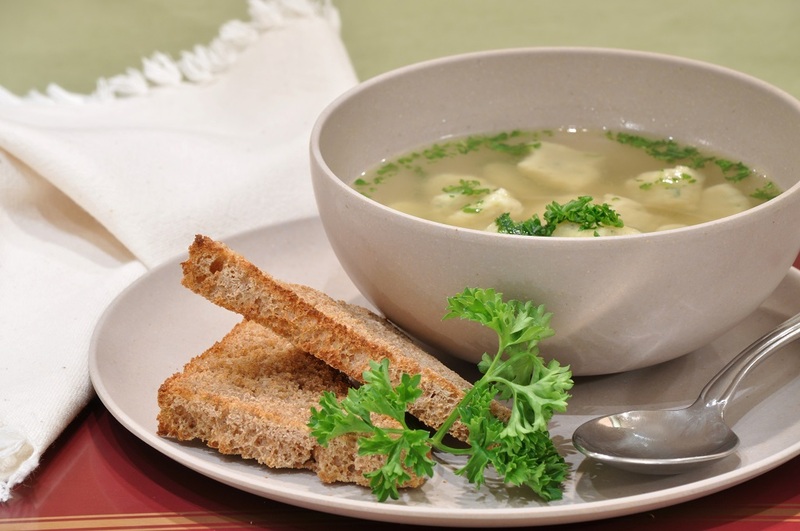 This recipe, in its original language, would be zuppa di Xavier. Just a thought. Line a large baking sheet with well-buttered parchment paper. Fit a sturdy piping bag with a large round tip. 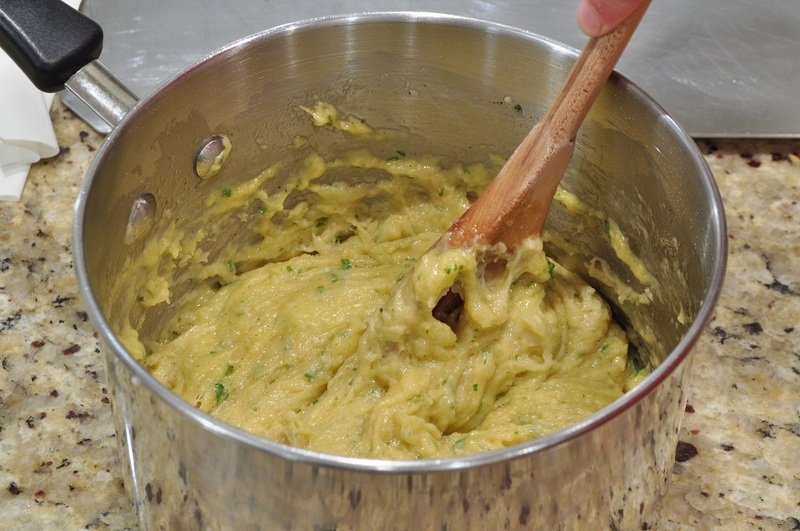 In a medium saucepan, over low heat, work the flour, cream, butter, and cheese into a soft dough. 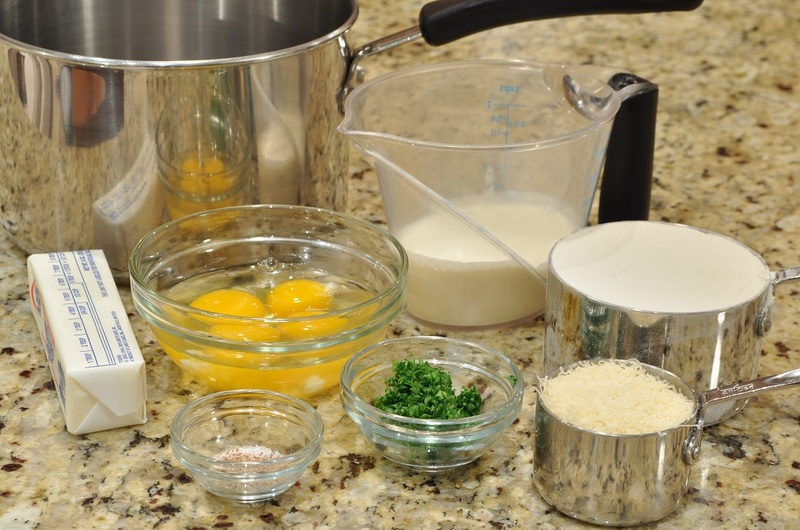 Remove the pan from the heat and beat in the salt, pepper, nutmeg, eggs, yolks, and tablespoon of chopped parsley. 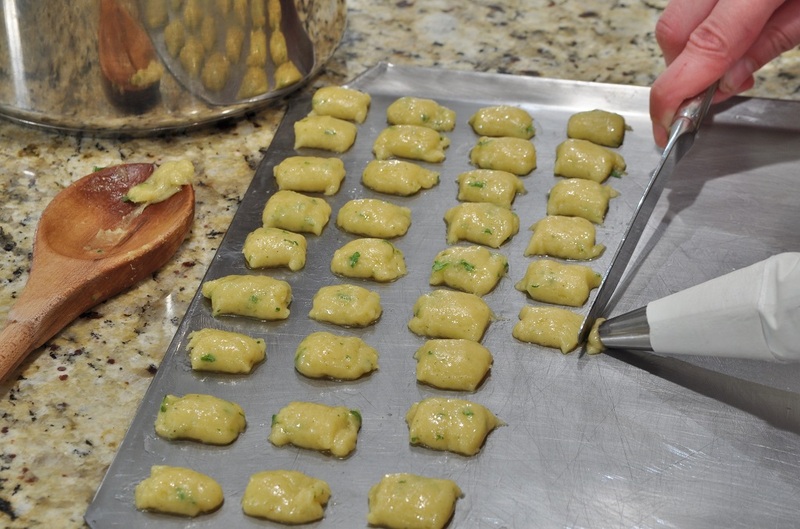 Spoon the dough into the piping bag and squeeze out 1-inch lengths onto the prepared pan. 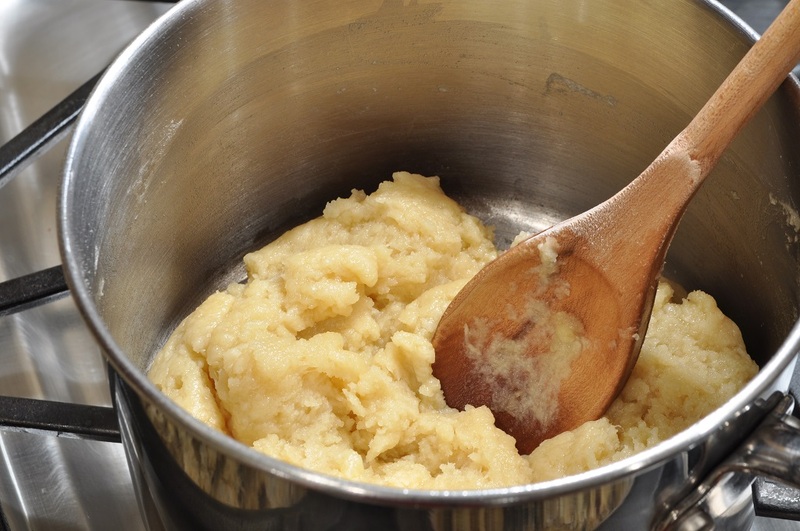 Use a butter knife to separate the dough from the tip once you’ve piped out shapes of the proper length. Bring a large pot of salted water to a boil. In another, smaller saucepan, warm up the chicken stock. 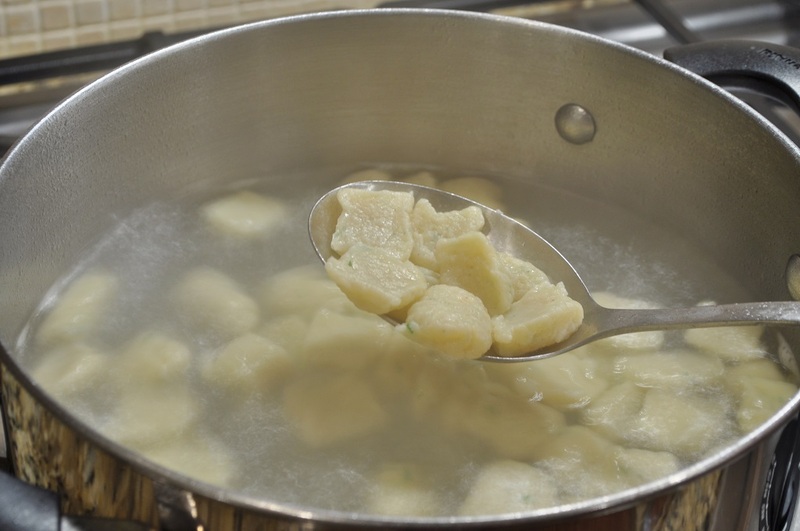 Drop one third of the dumplings into the boiling water, and boil until they are tender and cooked through, 8 to 10 minutes. Remove from the water with a slotted spoon and transfer them to the heated chicken stock. Repeat process with the remaining dumplings. 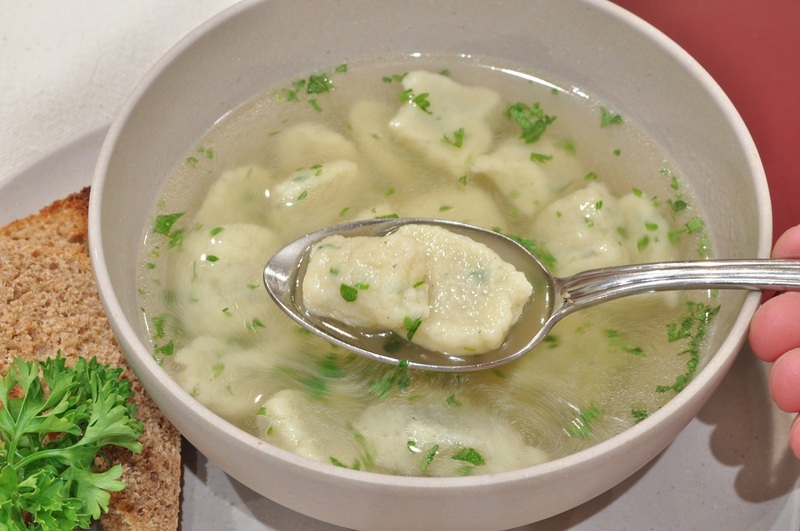 Once all the dumpling are cooked and in the chicken stock, ladle the soup into bowls and garnish with additional chopped parsley. Serve immediately. 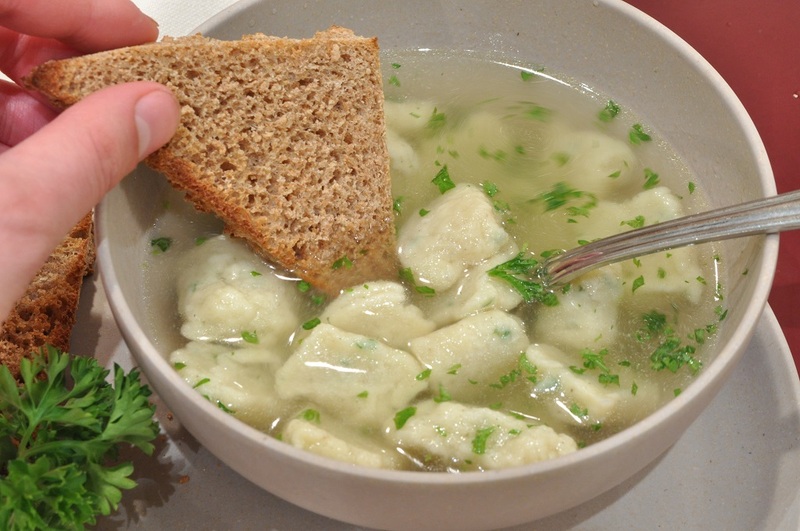 This is a brilliant entry for AlphaBakes and I am really impressed (and pleased) that you made this Xavier soup. I’ve definitely learnt something new today. Thanks so much for joining in AlphaBakes. Thank you, Ros. It was an enjoyable dish to make, and fun to track down a recipe beginning with X as well. Thank you, Rachel. Flat-leaf parsley is splendid–and easier to chop than the curly kind, too! Alphabet baking is so fun, isn’t it? It definitely forces you to be inventive and explore new recipes and cuisines. Ziti bake sounds scrumptious for Z!